This is basically the same preview as Friday's but with a bit of 'perceptive added value'. The late cancellation of the original game on Saturday because of a frozen pitch made the game un-playable and so this new date was quickly arranged. Following an early morning inspection by local FA officials when the pitch was passed to play on it seems that once the real referee arrived at the ground at 2:00pm he reversed that decision and called the game off. The team and the hundreds of travelling fans were sent back home disappointed that their time and money had been wasted. Who can blame them? There is now another inspection tomorrow at 1:00pm to save any more such problems if the game is called off again. Down here in tropical Worcestershire we woke up today with a hard frost but now, this evening, a thaw has set in and it's now gone quite mild and breezy. Is it the same in the North? With no changes to the sides it's to be hoped, again!, that we can win this at the first attempt and so have earned ourselves a less than mouth watering trip down to Wessex for the 2nd round game at Weymouth. Weymouth beat Wealdstone with a late Jefferson Louis goal in the ninetieth minute to go through to the next round. If we win tomorrow then I think we're good enough for a draw at Weymouth. We have to get through first and after the antics of Saturday I think we'll be fired up enough to do so. Doesn't time seem to fly? It was only six months ago that we were given the chance to appear at the new Wembley Stadium after getting to the final of the FA trophy and here we are again, about to set out on that same journey once more. Then it ended in a disappointing defeat to Stevenage after initially leading the game two nil at halftime through two James Constable goals and tomorrow we have to do it without him. Beano will play no part in this game but it will be the last game that he'll miss in this current three game ban. Just hope that when he returns for the Setanta Shield game at Hinckley next Saturday that he doesn't get booked because he'll then miss another game due to his four bookings already. The 'bug' that, some may say conveniently, hit the squad earlier this week, causing the Worcester Senior Cup game to be postponed, has now left the camp and everyone will be fit apart from Jeff Kenna who continues his second comeback from a hernia operation. Iyseden Christie is expected to start the game alongside Justin Richards and it's a foregone conclusion that we'll be wanting to put paid to Guiseley at the first time of asking. Nobody wants an un-needed replay at this time of the year. Guiseley, a team that play in the Unibond Premier League, are situated in North West Leeds and this will be our first ever meeting with them. We know very little about them or their players except maybe a couple as they both formerly played for Southport. Dominic Krief (midfield) and Steve Dickinson (goal) both played against us in our first season back in the Conference two years ago but then moved on to new clubs last season - Kreif to Farsley then Guiseley and Dickinson who came back to the club he started his career with. To bolster their slim chances of beating us tomorrow they have bought in two new players this week. 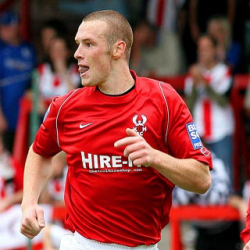 Tom Agus is a defender formerly with with Alfreton Town and Buxton while Darren Thornton is a midfielder who was at Scarborough for a while and has joined Guiseley from Whitby. One player has left the club this week. Robert Pell has now re-joined Frickley Athletic from whence he came. The injury situation at Nethermoor is not really known but their message board has mentioned that James Hanson might be out with a pulled a muscle. The weather conditions are just as bad up there as it has been down here the past few days with freezing conditions. This, and also some wet weather, has lead to their last two games being called off so this one could be touch and go. If it does go ahead I think we should start out on our return journey to the Wembley Towers, sorry Arch, with a win. Not a big win but enough to see us through. Bevan, Coleman, Harkness, Bignot, Creighton, Whitehead, Munday, McGrath, Ferrell, Hurren, Russell, Penn, Richards, Blackwood, Barnes-Homer, Smikle, Christie. Dickinson, Denton, Hay, Sturdy, Ellis, Hall, Thornton, Tiani, Dunning, Knight, Smith, Bett, Agus, Hanson, Wilford, Krief, Rickers, Mumbly, Walters, Henry.